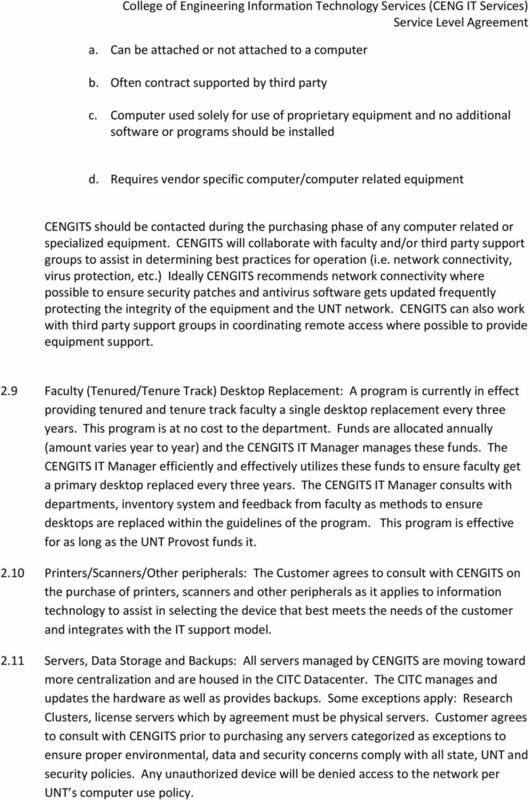 Download "CENG Information Technology Services University of North Texas"
2 1.0 Agreement 1.1 Purpose CENGITS supports The University of North Texas (UNT) mission to become a national research institution assisting College of Engineering faculty, staff and students in that mission by providing and supporting technology services. CENGITS supports the mission while abiding by policies established by the State of Texas (TX DIR), UNT and the UNT Computing and Information Technology Center (CITC). 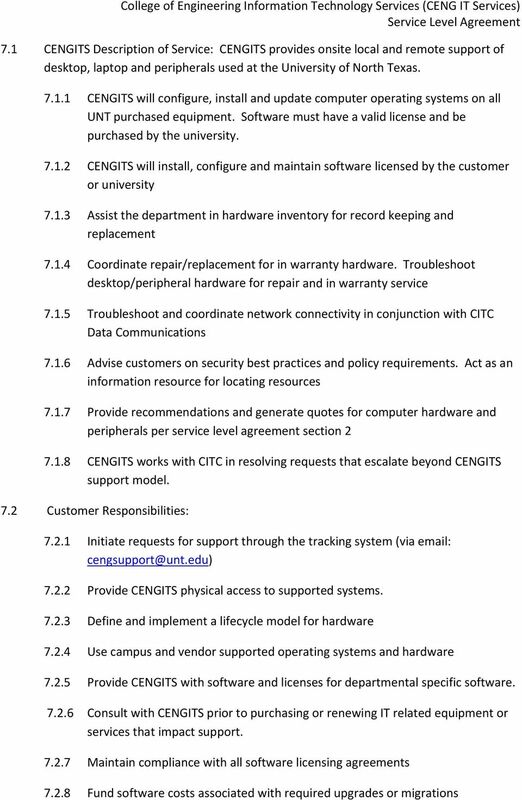 CENGITS exists as a distributed support team responsible for all computer technology related systems in the College of Engineering including but not limited to server, desktop. laptop computers and peripherals. The College of Engineering includes the following units: College of Engineering Office of the Dean, College of Engineering Advising Office, Computer Science and Engineering, Electrical Engineering, Engineering Technology, Materials Science and Engineering (including Center for Advanced Research Technology [CART]) and Mechanical and Energy Engineering. The purpose of this agreement is to define the responsibilities of the College of Engineering Information Technology Services (CENGITS) and College of Engineering Faculty, Staff, Student Assistants and Students (Customer) in supporting Information Technology services associated with the College of Engineering. 1.2 Agreement Terms The term of this agreement is effective immediately upon review and acceptance by the College of Engineering Dean and Department Chairs. This agreement is perpetual. Modifications to this agreement will be attached as amendments to the original agreement. 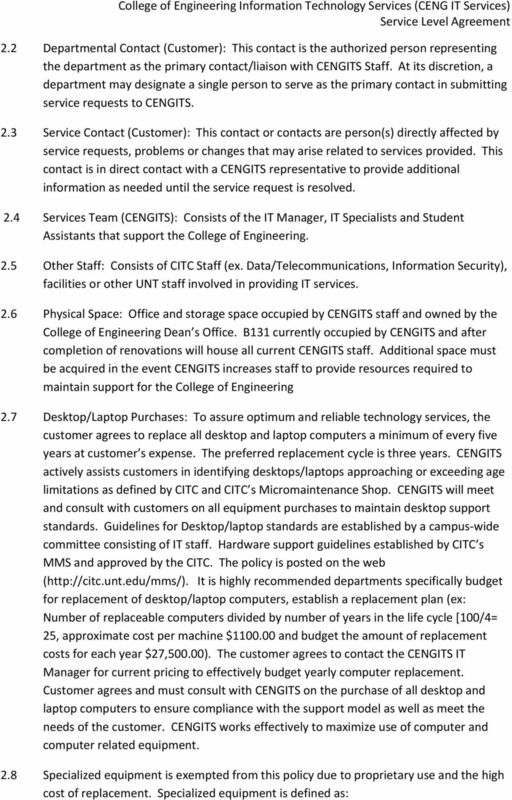 The document is subject to change based on changes in State of Texas (TX DIR), University of North Texas (UNT) or the Computing and Information Technology Center (CITC) Policies. This agreement is available as a reference to all College of Engineering Faculty, Staff and Student Assistants for review. The Departments agree to review this document a minimum of every three years. 2.0 Personnel, Space, Hardware and Budget For services provided to the customer by CENGITS, the customer agrees to provide appropriate space, computer hardware, faculty and/or staff available required for CENGITS to complete service. Roles are defined below and a single person may fill multiple roles. 2.1 Sponsor: Sponsors are individuals authorized to enter into and receive service under this agreement which includes: College of Engineering Dean, CENGITS Manager, Departmental Chairs or Heads of Departments. 4 a. Can be attached or not attached to a computer b. Often contract supported by third party c. Computer used solely for use of proprietary equipment and no additional software or programs should be installed d. Requires vendor specific computer/computer related equipment CENGITS should be contacted during the purchasing phase of any computer related or specialized equipment. CENGITS will collaborate with faculty and/or third party support groups to assist in determining best practices for operation (i.e. network connectivity, virus protection, etc.) Ideally CENGITS recommends network connectivity where possible to ensure security patches and antivirus software gets updated frequently protecting the integrity of the equipment and the UNT network. CENGITS can also work with third party support groups in coordinating remote access where possible to provide equipment support. 2.9 Faculty (Tenured/Tenure Track) Desktop Replacement: A program is currently in effect providing tenured and tenure track faculty a single desktop replacement every three years. This program is at no cost to the department. Funds are allocated annually (amount varies year to year) and the CENGITS IT Manager manages these funds. The CENGITS IT Manager efficiently and effectively utilizes these funds to ensure faculty get a primary desktop replaced every three years. The CENGITS IT Manager consults with departments, inventory system and feedback from faculty as methods to ensure desktops are replaced within the guidelines of the program. This program is effective for as long as the UNT Provost funds it Printers/Scanners/Other peripherals: The Customer agrees to consult with CENGITS on the purchase of printers, scanners and other peripherals as it applies to information technology to assist in selecting the device that best meets the needs of the customer and integrates with the IT support model Servers, Data Storage and Backups: All servers managed by CENGITS are moving toward more centralization and are housed in the CITC Datacenter. The CITC manages and updates the hardware as well as provides backups. Some exceptions apply: Research Clusters, license servers which by agreement must be physical servers. Customer agrees to consult with CENGITS prior to purchasing any servers categorized as exceptions to ensure proper environmental, data and security concerns comply with all state, UNT and security policies. Any unauthorized device will be denied access to the network per UNT s computer use policy. 5 2.12 Personal Equipment: To maintain the integrity of the network, personal equipment (i.e. equipment not purchased with university funds) or computers not configured by CENGITS, including desktop, laptop and other networkable devices will not be granted access to the physical network. Guests, students, faculty and staff bringing personal equipment to campus will only be granted access to EAGLENET (Wireless). 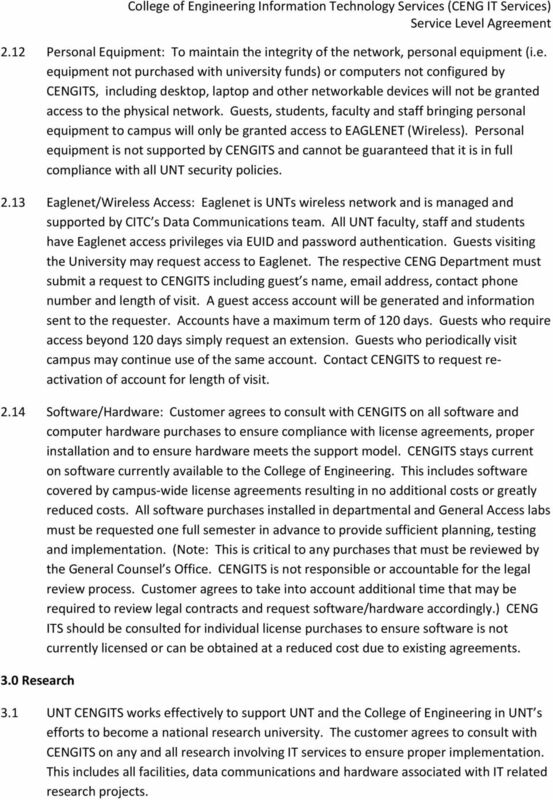 Personal equipment is not supported by CENGITS and cannot be guaranteed that it is in full compliance with all UNT security policies Eaglenet/Wireless Access: Eaglenet is UNTs wireless network and is managed and supported by CITC s Data Communications team. All UNT faculty, staff and students have Eaglenet access privileges via EUID and password authentication. Guests visiting the University may request access to Eaglenet. The respective CENG Department must submit a request to CENGITS including guest s name, address, contact phone number and length of visit. A guest access account will be generated and information sent to the requester. Accounts have a maximum term of 120 days. Guests who require access beyond 120 days simply request an extension. Guests who periodically visit campus may continue use of the same account. Contact CENGITS to request reactivation of account for length of visit Software/Hardware: Customer agrees to consult with CENGITS on all software and computer hardware purchases to ensure compliance with license agreements, proper installation and to ensure hardware meets the support model. CENGITS stays current on software currently available to the College of Engineering. This includes software covered by campus wide license agreements resulting in no additional costs or greatly reduced costs. All software purchases installed in departmental and General Access labs must be requested one full semester in advance to provide sufficient planning, testing and implementation. (Note: This is critical to any purchases that must be reviewed by the General Counsel s Office. CENGITS is not responsible or accountable for the legal review process. Customer agrees to take into account additional time that may be required to review legal contracts and request software/hardware accordingly.) CENG ITS should be consulted for individual license purchases to ensure software is not currently licensed or can be obtained at a reduced cost due to existing agreements. 3.0 Research 3.1 UNT CENGITS works effectively to support UNT and the College of Engineering in UNT s efforts to become a national research university. The customer agrees to consult with CENGITS on any and all research involving IT services to ensure proper implementation. This includes all facilities, data communications and hardware associated with IT related research projects. 6 3.2 Customer agrees to make provisions for support of any research cluster. 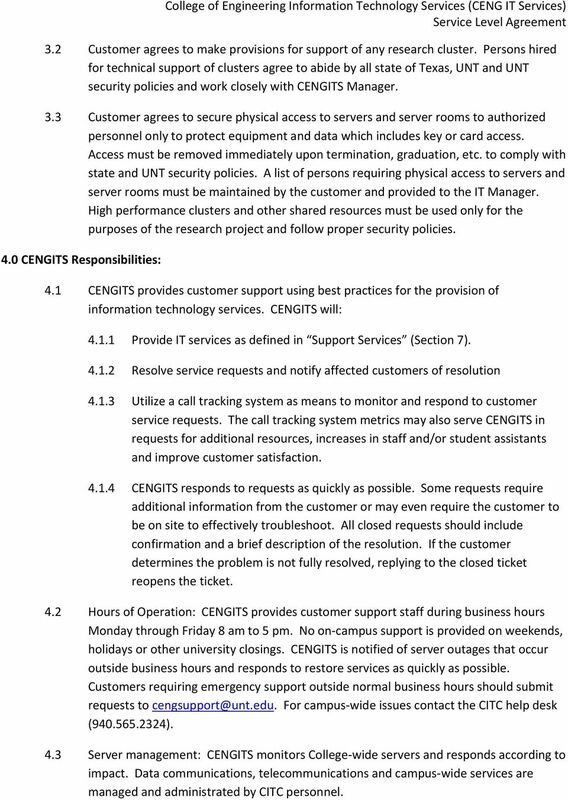 Persons hired for technical support of clusters agree to abide by all state of Texas, UNT and UNT security policies and work closely with CENGITS Manager. 3.3 Customer agrees to secure physical access to servers and server rooms to authorized personnel only to protect equipment and data which includes key or card access. Access must be removed immediately upon termination, graduation, etc. to comply with state and UNT security policies. A list of persons requiring physical access to servers and server rooms must be maintained by the customer and provided to the IT Manager. High performance clusters and other shared resources must be used only for the purposes of the research project and follow proper security policies. 4.0 CENGITS Responsibilities: 4.1 CENGITS provides customer support using best practices for the provision of information technology services. CENGITS will: Provide IT services as defined in Support Services (Section 7) Resolve service requests and notify affected customers of resolution Utilize a call tracking system as means to monitor and respond to customer service requests. The call tracking system metrics may also serve CENGITS in requests for additional resources, increases in staff and/or student assistants and improve customer satisfaction CENGITS responds to requests as quickly as possible. Some requests require additional information from the customer or may even require the customer to be on site to effectively troubleshoot. All closed requests should include confirmation and a brief description of the resolution. If the customer determines the problem is not fully resolved, replying to the closed ticket reopens the ticket. 4.2 Hours of Operation: CENGITS provides customer support staff during business hours Monday through Friday 8 am to 5 pm. No on campus support is provided on weekends, holidays or other university closings. CENGITS is notified of server outages that occur outside business hours and responds to restore services as quickly as possible. Customers requiring emergency support outside normal business hours should submit requests to For campus wide issues contact the CITC help desk ( ). 4.3 Server management: CENGITS monitors College wide servers and responds according to impact. Data communications, telecommunications and campus wide services are managed and administrated by CITC personnel. DESKTOP SUPPORT SERVICE LEVEL AGREEMENT Pace University and Client Support Offices Summary This document covers the desktop support services offered from the Client Support Office for Pace University members. Get what s right for your business. Contact @lliance Technologies. Service Level Agreement and Management By: Harris Kern s Enterprise Computing Institute Service Level Management Service Level Management deals with how user service requirements are understood and managed. Questions and Information on Centers TWU Service Desk. Please kindly respond to the following for your center.